When it comes to Pentium 4 processors, the rule thumb is that Intel's CPUs perform best on Intel chipsets. Third party competitors have encountered a whole host of problems attempting to break into this market; from reliability to product shortages, performance qualities, and even licensing issues, there are formidable barriers to creating core logic for Intel CPUs. This is why it's refreshing to see nVIDIA enter the Intel chipset world. After witnessing what nVIDIA was able to do with AMD in a few short years, the future for what it could bring to the Intel platform is quite alluring. At the moment however, the only Socket 775 Intel chipset that supports dual videocards is nVIDIA's nForce4 SLI Intel Edition; and SLI is what many consumers are looking for (even if they don't have plans to utilize it just yet). The AMD version has been hugely successful, especially in the high end market. It's about time Intel users get a taste of this success. While the chipset was announced a months ago, nForce4-SLI Intel Edition motherboards are just now hitting the market. MSI Computers new P4N Diamond looks well... like a real gem of a motherboard! Obviously based on the nForce4 SLI Intel Edition chipset, the motherboard supports Socket 775 800/1066 MHz FSB Pentium 4/XE, Pentium D and Celeron D processors as well as a maximum of 4GB of DDR2-667 memory. Other goodies include dual Gigabit NICs, a Creative Labs Live! 7.1 sound card, IEEE 1394a and an additional Serial ATA II controller. If you feel the need to upgrade there is one open PCI Express x1 slot (two if you run a single videocard) and two PCI slots for legacy peripherals. A flurry of USB2.0 headers and of course two PCI Express x16 slots also dot the large black motherboard. 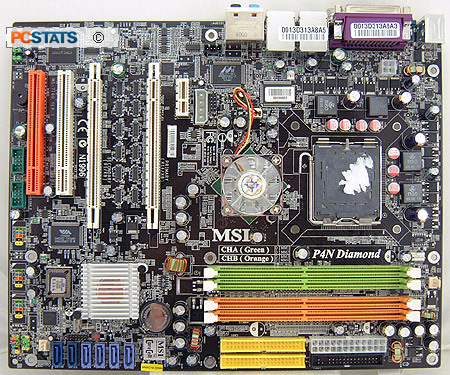 Well the MSI P4N Diamond motherboard sure is colourful, I am sure that is something case modders will appreciate. The motherboard layout of onboard components is great, and I wish more motherboard manufacturers would follow MSI's lead here. From the IDE connectors to the Serial ATA Ports, additional molex power connector and the onboard headers, everything is in its ideal location without getting in the way of anything else. MSI takes customer service to the next level, not only are its users manual and quick installation guide easy to read and understand, its motherboards are extremely user friendly. For example just look at the USB headers on the motherboard, MSI is the only company at the moment which colour coordinates these headers. With front panel USB slots gaining huge popularity, this was definitely a nice touch. I like how MSI places a clear CMOS button on the P4N Diamond motherboard instead of requiring users to short jumper pins, more manufacturers should do the same. 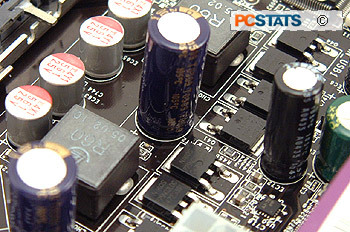 Capacitor quality is such a big issue, many motherboard manufacturers are now openly advertising this. The brands found on the MSI P4N Diamond are Rubycon, Sanyo, Nichicon, HM and a brand that uses a M as its logo. Everyone knows that Socket 775 is a lot more fragile than previous sockets due to the exposed pins. MSI does its part to try and keep consumers safe by including a special CPU installation mechanism. While experienced users should not have any problems installing the processor, this clip and accompanying guide will surely help novice users install the socket 775 Intel Pentium 4 processor into the socket right on the first go.